Since 1998, the year we started our "greenfield operation", the market condtitions changed considerably, giving us some good reasons to evaluate our position and create new opportunities. We started by april 2009 with an enhanced team and a training and riding facility in The Netherlands. Our head office is still located in Belgium near Brussels. However, we do not forget our roots and will also continue operating as brokers and traders based near Brussels (Belgium) having from there the best outlook on the European market. Our company is specialized in the better quality horses: Hunters, Jumpers and Equitation. We work with reliable trainers, breeders, riders and horse owners all over Europe. Therefore we are always able to find the perfect horse(s) for you. Because of our unique system of search and in depth assessment, you dont have to waste too much of your precious time looking for suitable horses. 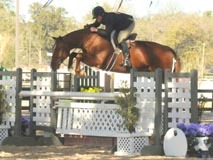 Once we know exactly what you are looking for, we contact the owners who have at that moment the right horses for you. We travel around with you or we bring all interesting horses together at one place where you can try them as much and as long as you want. Trying horses a second time somewhere at a different place to see if they are really good and trustworthy is no problem. Our clients decide where they want to have executed the purchase exam or we recommend a top veterinary clinic, which specializes in purchase exams for export. We can also take care of the transportation and all handling of your horses. Greenfield Stables Belgium sell only healthy and quality horses. Please contact us and let our experience work for you. We promise personal attention and honest advice. We look forward to hearing from you.